Despite its improved CoT structure, silver looked especially vulnerable last week because its chart pattern was simply screaming for a short-term plunge. Gold as well appeared to be destined for a test of major support. The critical levels of Au 1524 and Ag 26 held and with the bad ‘jobs’ report on Friday, the metals surged upward as the market apparently believes this will quell any talk by various Fed jawbones about withdrawing QE. All well and good, but we are in a volatile time when desperate policy is being employed against the economy’s chronic contraction, the stock market’s time window for a bear market cycle and a global financial system that is coming apart at the seams. In short, this is financial war and one wonders whether the precious metals are going to simply go on their merry way without further damage. But we have our parameters, they are intact and the metals are showing some positive signs, as they (gold, especially) should in such an environment. There is a lot of technical damage to be undone however, and we’ll move forward accordingly. After gold bottomed last summer and the Fed came with the QE (sanitized though it was by Op/Twist), the gold “community” thought it knew that gold was headed ‘to da moon!’. They thought this in mid-2011 as well. But the red ovals in the CoT data at those times refuted this. Remember our “who are those guys?” (Butch Cassidy reference) question last fall? Who are those guys and why are they aggressively arrayed against gold when we all know gold’s time is at hand? We don’t need to know the ‘who’ and ‘why’. It can be left for the tin hat wearing conspiracy detectives in the gold “community” to enthrall us with all the details (both real and imagined by fertile imaginations) about the evil entities. Our job however, is to not become victims of whatever it is that is going on. So the CoT structure became very bearish last fall and gold bugs that were too set in their ways to heed it have paid the price in capital and in quality of life. But it is now that we are concerned with. The past is done. The CoT data have come to the bullish levels of last summer just as the price of gold is testing those very same summer lows. Throw in the contrary bullish sentiment structure and what does this tell us? Well, it tells me – a chronic risk manager, as you know – that the bullish possibilities are not only alive and well, but becoming probable just as the CoT and over bullish sentiment told us last fall that corrective activity was coming. Let’s not out think ourselves here. I cannot apologize for telling you that the above picture is bullish just as I could not apologize for noting the bearish alignment in October. Will gold break major support (1524) per the loud and growing insistence of the financial media, the big banks’ analysts and every trend following wise guy on the planet? I cannot promise it won’t. 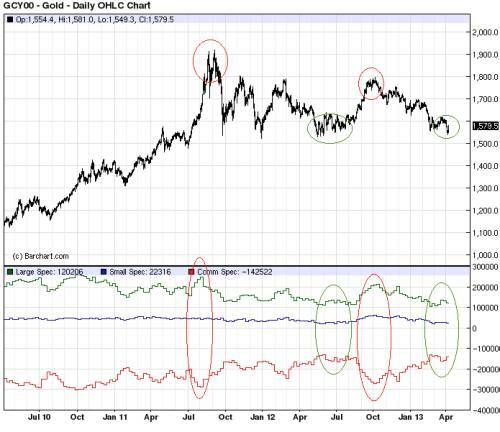 But gold is now in a bullish stance for contrarian thinkers, and that is not wishful thinking. It is the CoT, sentiment and proximity to major support combining to tell their story. 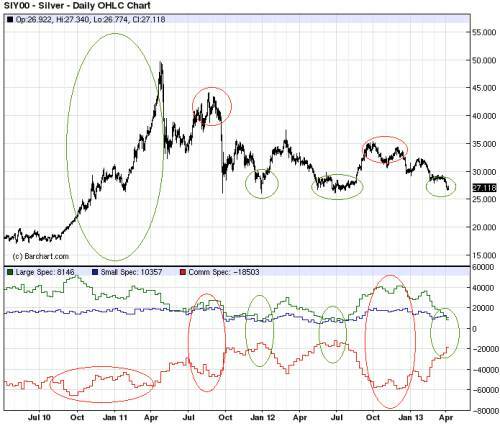 Silver is not always as cut and dry as gold with respect to CoT structure relative to price movements. In particular, the big rise in 2011 came against a generally bearish CoT formation. I wonder if there was a loss of control there by da boyz as Ag blew off in a short-covering frenzy. I also wonder if da (Wall Street) boyz might have firmed up their grip on things through more intense operations working closely with the Fed, the ECB, the CFTC, the big financial media and any other entities with an interest in keeping the precious metals under wraps. Yes of course, that is my tin foil hat talking. I have one, but I try to keep it out of the functional analysis. So back to the chart, aside from 2011, the CoT has generally helped call tops and bottoms. The structure is pretty good now from a contrarian bull standpoint.